The Karnataka government has launched the first phase of the world’s largest solar power park at Pavagada in the state’s Tumakuru district. The park was inaugurated by the state’s Chief Minister Siddaramaiah, who revealed that the project was developed in a record time of just two years with zero land acquisition. Christened ‘Shakti Sthala‘, the solar park has been developed in an area of around 13,000 acres which is spread over five villages, and is capable of generating 2,000 MW of power. In the initial stage, only 600 MW power will be generated by the park, and it is expected to reach its full 2,000 MW power generation capacity by the end of 2018. It was a proud moment to witness the opening of the #worldslargestsolarpark in Pavagada today. 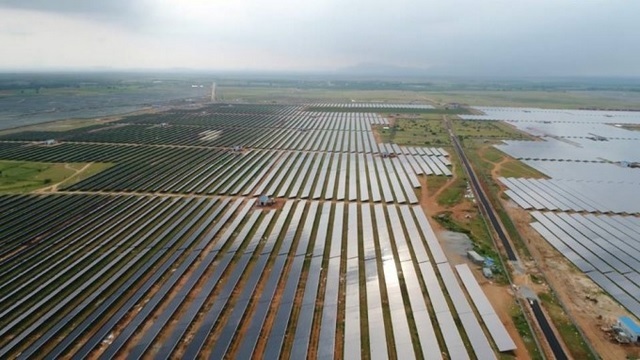 The solar park’s construction was overseen by the Karnataka Solar Power Development Corp. Ltd (KSPDCL), a collaboration between the Karnataka Renewable Energy Development Ltd (KREDL) and Solar Energy Corp. of India (SECI). The Shakti Sthala solar park is expected to create approximately 4,000 job opportunities for folks belonging to the local community. “We have set the goal to source at least 20 percent of people’s power requirements from renewable projects. This ambitious project, spanning five villages, looks at farmers as the key partners, as also beneficiaries. Shakti Sthala is creating new job opportunities and economic growth leading to the prosperity of the people of Pavagada”, said the state’s CM at the inaugural event. Instead of acquiring land, the Karnataka government chose to lease the required landmass from around 2,300 local farmers who will be paid a 21,000/year sum as a rental fee for the next 25 years. The rental fee awarded to the farmers for leasing their land will be increased by 5% every two years as a reward for their active participation in the state’s development process. Moreover, the land selected by the state government to build the solar park was located in a drought-prone area, which further minimized any ethical issues.